A few years ago I ran into a 3/4 cello with unusually strange top wood and now recently I’ve run into another, a 4/4. This is also an old Italian cello, of about the same age, and it works fine. Something interesting about both of these cellos is that while we’re taught to think that slab-sawn wood like this is weak and liable to crack (slabbed maple violin backs certainly do this) the tops on both of these cellos were both in unusually good condition for instruments of their age. 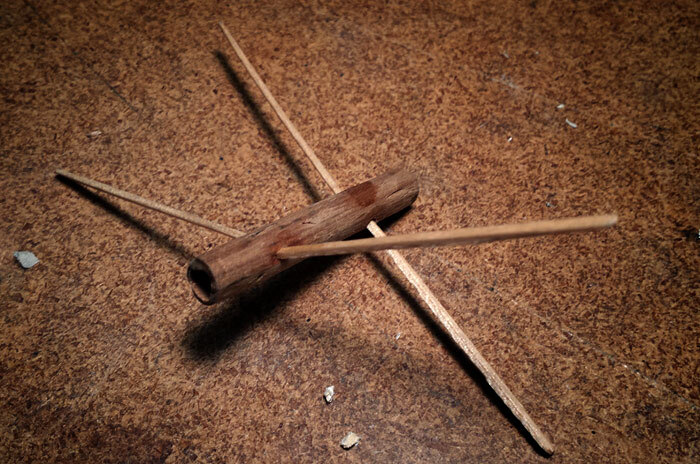 Usually tops and backs are just glued directly to the ribs and linings, nothing fancy. At various places and times in the past, though, sometimes makers locked the top and back in place. 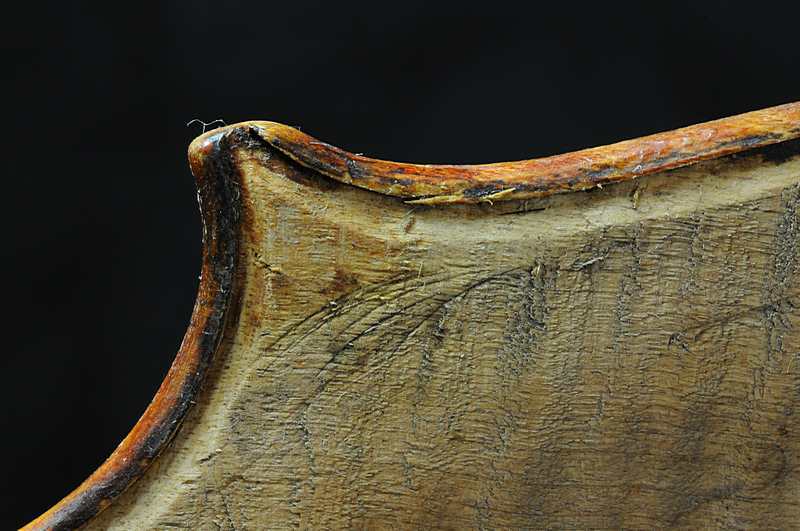 This is seen in very old French violins and Dutch, also, but usually just as a thin groove slotted into the back or top, the width of the rib thickness, into which the rib is glued. Though this is mostly hidden, there are two nearly invisible clues that a back has the ribs set in. The first is that in spite of their great age, the margins of these backs and tops are usually flawlessly even all around. Where normal ribs can move and bulge, ribs set in a groove can’t. The other clue is to look at the back and rib junction right at the tops of the corners–the area in the photo above. Usually the fit isn’t perfect right at the point and a bit of the groove will commonly be visible there. You can see in this photo how that spot would be easily visible on this corner. While you’re noticing things, observe how the shape of the corner blocks was cut after the blocks were in place: you can see the arc-shaped cuts in the back that the gouge made in the process of shaping the blocks in place! 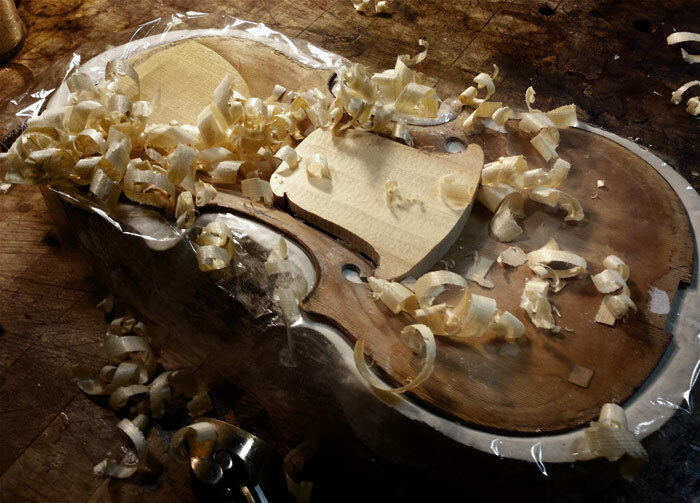 In this Dutch violin the maker has taken it one step farther, cutting a ramp with some unusual characteristics. Now, referring back to the opening photo, try to imagine what the lining, just inside the rib, is sitting on–a slanted ramp. In this violin the lining was not fit to the slope of the ramp. All it was doing was covering a puddle of glue hidden under the lining. Because of the undercut flange, this didn’t matter, and the rib was well held in place. The only reason I had to see any of this was that the edge in the lower bout had been worn down from the outside to the bottom of the slanted groove by the players shoulder and was falling off. The back and rib had to be separated to repair this edge. 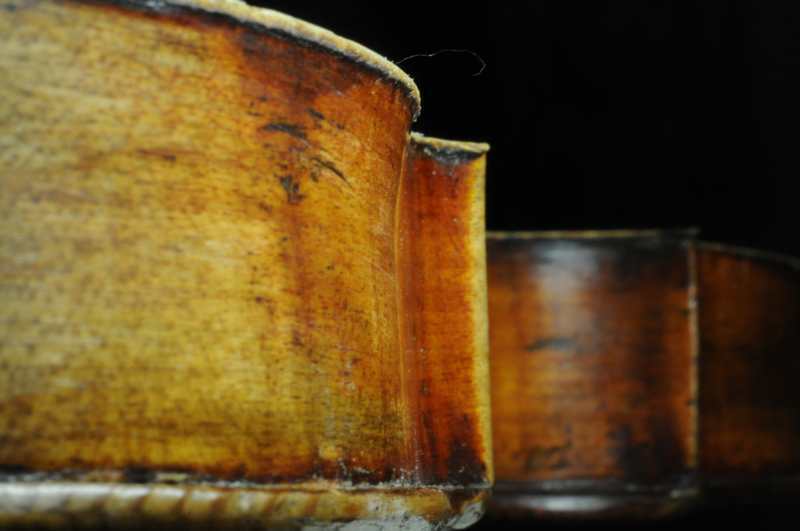 Sometimes a violin’s arching is vulnerably flat, perhaps the wood is weak, or thin, or a combination of those, and the center under the bridge starts to collapse. Often this is accompanied by the top puffing up under the board and the tailpiece, towards the ends. In such a situation, the arching is first corrected back to the way it originally was made, and then often some sort of reinforcement is put in. On this violin from the mid 1700s the collapse had caused a crack, and there were several other problems. The first step here was to make a plaster mold (cast), then reshape the mold through several generations of corrections of the mold and the top. Then when the arch was back to a proper shape, I put in a very thin patch to hold the arching in place. That’s the patch in the center that’s being thinned in this photo. In this case, the upper area around the top block needed correction and reinforcement, and you can see the finished patch in place there, up towards the neck area. The final thickness of these two patches was only around 0.5mm–just enough to do the job!